Premiership strugglers London Irish produced a brilliant second-half performance to shock high-flying Saracens at the Madejski Stadium. Tom Homer and Charlie Hodgson exchanged first-half penalties to leave the game evenly poised at the break. But Shane Geraghty and Ofisa Treviranus both scored tries in the second period to give Irish a memorable victory. David Strettle's touchdown was a rare moment of cheer for Sarries, who missed the chance to go top of the table. In an opening period dominated by the boot, Hodgson and Homer both fired over penalties to leave the scores level at 6-6. Former England international Hodgson missed a further opportunity from a tight angle as both teams struggled to take control in a tight contest. Irish came closest to a try, but Pat Phibbs crucially knocked-on after Bryn Evans crafted a good opening for the hosts. Further penalties from Homer and Hodgson ensured the sides went into the interval all square, but after Homer kicked the hosts ahead early in the second half, Geraghty produced the first try of the match. The 26-year-old, only in the side as a late replacement for the injured Jonathan Joseph, stole in to intercept on half-way and ran clear to put daylight between the teams. Another penalty from Homer extended the advantage, before Strettle's jinking run and try, converted by Hodgson, pulled the score back to 22-16. But three minutes later, replacement Treviranus eased Irish nerves once more, going over after good build-up play from Topsy Ojo. Homer was again reliable with the boot, converting to restore the home side's 13-point lead. Despite a missed penalty by Homer in the closing stages, Irish held on to secure back-to-back Premiership victories for the first time this season. Saracens, who went into the match on the back of an eight-match winning run in all competitions, dropped a place to third. 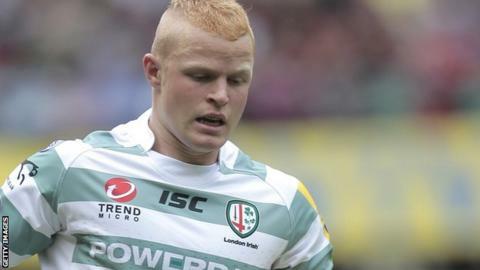 London Irish director of rugby Brian Smith said: "It was a ding-dong battle and neither side were too far ahead in any area of the game. "Up front the boys probably edged it and put the squeeze on the Saracens, especially in their own 22. "Shane only knew he was starting at 11:00 GMT as Jonathan Joseph stubbed his toe in training. "I am especially pleased for Shane as he has skippered the team well in the past few weeks and responded brilliantly to the call-up, scoring the defining try." Saracens coach Mark McCall said: "We were pretty poor overall today. I thought London Irish played well and put us under a lot of pressure, but especially in that second half we put a lot of pressure on ourselves. "It wasn't the normal Saracens. We lacked a bit of control and our decision-making wasn't as good as it normally is today. "They waited for us to make mistakes and we made those mistakes." London Irish: T Homer, T Ojo, G Armitage, S Geraghty, M Yarde, I Humphreys, P Phibbs; M Lahiff, S Lawson, H Aulika, G Skivington, B Evans (capt), M Garvey, J Sinclair, C Hala'ufia. Replacements: M Mayhew, J Yanuyanutawa, L Halavatau, J Gibson, O Treviranus, K Low, S Shingler, J Moates. Saracens: Wyles; Maddock, Tomkins, Taylor, Strettle; Hodgson, de Kock; Auterac, Smit, Stevens; Borthwick (capt), Hargreaves; Kruis, Fraser, Joubert. Replacements: Brits, Gill, Plessis, Botha, Wray, Wigglesworth, Mordt, Short.